Between 8/8/15 at 1830 hours and 8/9/15 at 0018 hours, an unknown suspect committed a vehicle burglary in Gilbert by removing the victim’s purse from the trunk. 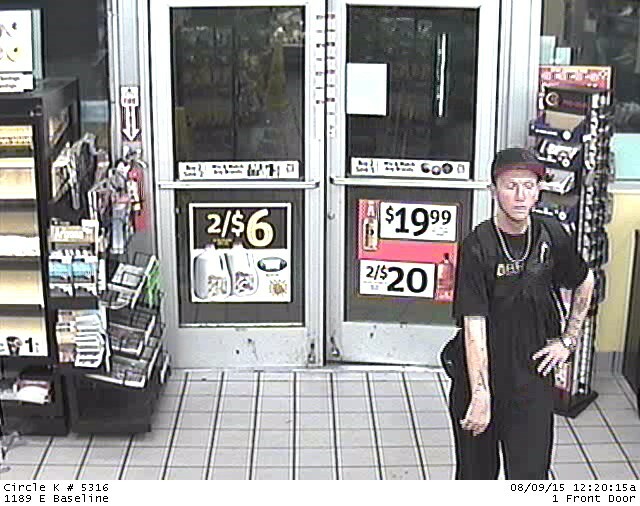 On 8/9/15, an unknown male suspect (pictured) entered the Circle K located at 1189 East Baseline Road in Gilbert and used the victim’s credit card to purchase goods. The male suspect was seen again at the 7-Eleven located at 1157 North Gilbert Road in Gilbert with an unknown female subject. The female suspect used the same stolen credit card to purchase goods at the 7-Eleven.